Facebook Messenger has released additional ways to communicate with customers, in the form of three new message tags to be used by businesses and developers. In April, Messenger announced that it was launching message tags to help businesses respond to customer actions and “send messages for specific uses cases beyond the 24-hour window” mentioned in its Platform policy. Since then, it added five new ones, and is now adding three more to the mix. Messenger announced the addition of three new message tags: Account Update, Payment Update, and Personal Finance Update. It also announced the launch of a new tag suggestion form, to be used by developers who would like to suggest new message tags. All tags are strictly limited to sending non-promotional content only. Account Update: The ACCOUNT_UPDATE tag can only be used to provide a user with an update on their account settings. With this tag, a user can be notified of a change in account settings – password change, membership expiration, etc. Payment Update: The PAYMENT_UPDATE tag can only be used to update users on existing transactions. This tag allows the sending of receipts, out-of-stock, auction ended, refund or status changes for an existing purchase transaction. 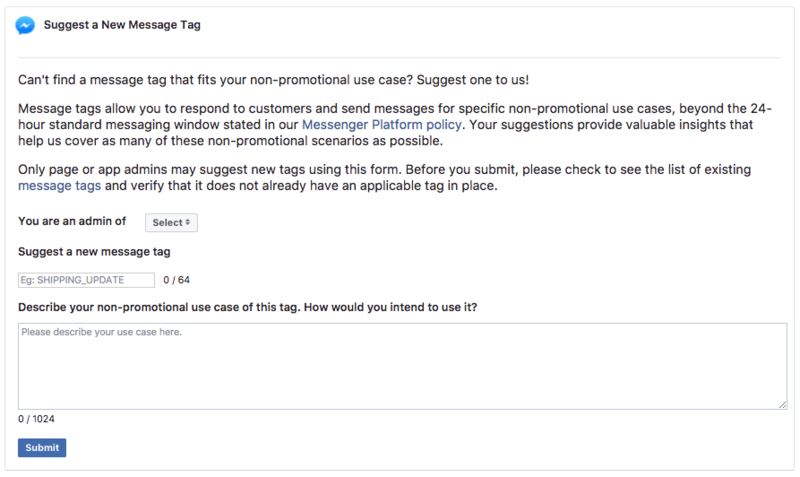 Additional to the above, Messenger also announced the availability of a new tag Suggestion Form , allowing developers to suggest new tags by choosing names for them and describing their use case. Again, they should follow the logic of non-promotional messages beyond the 24-hour policy window.